For B2B marketers lead generation is most important. Although it underlies all their activities, it’s not always clear what the best practices are to provide sales with qualitive leads, since all roads lead to Rome. Do you want to know how to take lead generation in your organization to the next level? Then read this blog, in which we answer four frequently asked questions about B2B lead generation. 1. Everything starts with the visitor. How do I lead visitors to my website? There are various ways to attract visitors to your website. You can, for example, advertise online, use social media or fully optimize your website for search engines (SEO). Yet, the best way to get visitors to your website, is by content creation. Content can take many forms, such as blogs, eBooks, videos, and so on. Consequently, this content can be shared and sponsored in various ways to increase traffic. 2. How do I transform an unknown visitor into a lead? It’s important that your content matches the needs and desires of the customer. Therefore, do not reason from your range of products and/or services when creating content, but take the perspective of the customer’s demand. That’s the only way to convince a ‘stranger’ to pass on his data, so he no longer is a stranger, but a known visitor. You can then continue to provide the visitor with content, with which you guide him through the entire purchasing process. This way the stranger becomes a lead! Note: sufficient insight into your target group is a prerequisite for creating the right content. A buyer persona is a tool that can help you to effectively use those insights in marketing. 3. How do I turn my website into a useful platform for lead generation? 4. How do I ensure good cooperation with sales? Not only the marketing department is important in the lead generation process, the sales department also plays a decisive role. After all, your sales colleagues are the ones that ultimately seal the deal with your leads. However, the cooperation between marketing and sales does not always run smoothly. In some organizations there even is a rivalry between the sales and marketing department. The tips below will help you to prevent this undesirable situation, and form a commercial team that cooperates smartly, a so-called SMarketing department. Make sure there is clear communication between both departments. 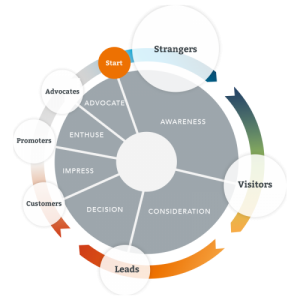 In the first phases of the lead generating process marketing can already learn a lot about the identity, demands, desires and customer journey of your leads. This valuable information must be shared with sales to ensure a successful follow-up. In cooperation with sales, determine which leads you would like to have, and also think about leads that are not that interesting. This way you can focus your time and effort on the leads that have real potential. Take care of the quality of your leads. Naturally, your sales department needs a certain basic amount of leads to reach their targets, but quantity should not be your sole priority. Ultimately, the better the quality of your leads, the greater the chance that these leads actually transform into customers. Want to know more about B2B lead generation? Read our eBook Introduction to Lead Generation.